Fifteen years. Fifteen years of sluging it out in bars, small venues, breweries, amphitheaters, football stadiums ... basement studios. The Jeremy Vogt band is an appreciated staple of the Indianapolis music scene, but is still somehow vastly underappreciated for what they bring to the scene, not just as a tight knit band led one of our premier songwriters, but as veterans who set a standard and a bar that is, well, systematically ignored by every other band in the local scene. In the course of the 12 or 13 years I've been following them, I've witnessed a rise from auspicious beginnings as a reasonably popular cover band with the best music of "Play that Funky Music" in the city, through the polished pop of People in Strage Places, through the slightly-edgier Villains and Vocorders, up to his latest, most laid-back organic project, Rise of the Common Man. They were one of the first groups to embrace the experimental project that is Indy In-Tune, have been frequent repeat guests over the last dozen years, have played numerous charity shows and podconcerts for us, and are genuinely one of my favorite acts to go see and hang out with after a show. 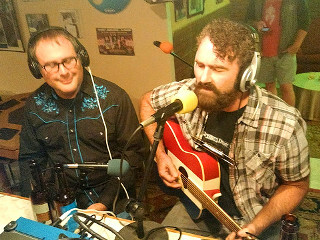 This podcast was recorded during the afternoon before his ladnmark 15th anniversary show at Black Circle Brewing, and represents a mammoth effort to edit down two hours of reminiscing, sidebar conversations, and in jokes that probably nobody would think is funny but us, down to the essence of where JVB hs been, and where they are now. In a nutshell, this is a band that's on a journey, guided strictly by an instinct for what feel right to them, and with no destination currently in sight. I know I once said I thought they'd be big someday, and though I've really reconsidered what the definition of "big" is over the more than a decade since I said that, I still believe it. Secretly, however, I wouldn't mind if we were all back in Studio B still doing this for his 25th anniversary show. They have previously appeared on Show #004, Show #057, and Show #139. Brandon Schaffer previously appeared with his other project, The Long Arm, on Show #219. Jeremy, Darrin, and Radio Free Indy's MP Cavalier, are -- by day -- three of the leading business analysts in the city of Indianapolis. It's an odd profession, often likened to being the utility bass player on the project team. You won't notice them unless they're not there or if they mess something up. We've not yet made any significant correlation between people who remain business analysts for far too long and people who remain in the local music scene far too long. All of his albums are currently available at the usual suspects: Amazon, iTunes, CDBaby. We elude to a video about the making of Why Worry that is available on YouTube and provides great insight into his songwriting process. 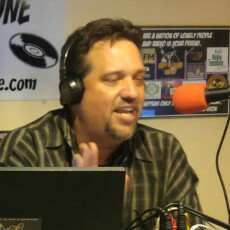 Darrin Snider is the founding music nerd responsible for Indy In-Tune Radio and the Indy In-Tune Podcast. By day he is a business analyst and recovering software engineer, which is fun, but he hopes to downgrade to overnight FM disc jockey someday. Other various and sundry audio we've collected over the years.